Two days shy of the fourth anniversary of Hurricane Sandy pummeling major swaths of New Jersey, the state Assembly Regulatory Oversight and Reform and Federal Relations committees listened to stories of heartbreak, financial ruin and poor planning that victims say continues long after the state’s worst natural disaster. With speaker after speaker complaining about the slow recovery process, victims hammered at the state’s Reconstruction, Rehabilitation, Elevation and Mitigation program, a federally-funded plan designed to help homeowners pay for repairs but has been fraught with problems from the start. The state’s main housing recovery program came under attack because of slow progress. “We are far from finishing the job,” Gordon said, noting the state expects to spend all the Sandy aid funding by the end of this fiscal year next June. “We need to finish the job because these funds were supposed to make people whole and we’re just too far away…from making sure that happens,” he said. “I don’t know what these numbers are and I honestly have no idea how I’m going to repay them,” she said. Joe Karcz, who’s still not back in his home in the Beach Haven West section of Stafford Township, asked for a law granting Sandy victims waivers from the financial penalties of early withdrawals from their pensions. 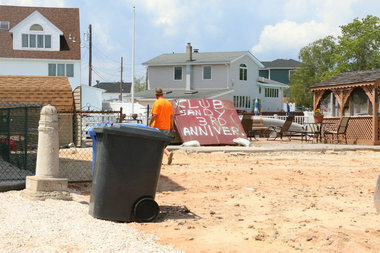 He cited the example of the former Joey Harrison’s Surf Club in town, which was destroyed by Sandy. The oceanfront property is now for sale, but the state won’t buy it through its Green Acres program because it instead wants large swaths rather than individual parcels.